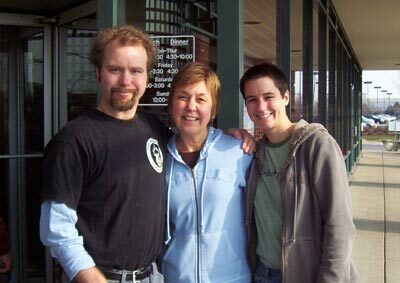 Three and a half years after Craig Ewert's death, his wife Mary and son Ivan offer their thoughts on Craig's decision and their hopes for what the film might accomplish. What have been some of the challenges since Craig's death? Mary: When I think about challenges related to Craig's death, I think more of the period prior to his death rather than afterwards. There was the need to cope with the diagnosis of an always-fatal disease, followed by the struggle we both faced to ensure that Craig would not endure pain and suffering at the end. We were forced underground, unable to discuss our plans with anyone outside our immediate family circle and a few brave advocates. Because we knew the end of life was near, Craig and I had an opportunity to say all of the things that we needed to say to one another, to spend some really close time together, and that has really helped ease his passing for me. His memory is always near, but of course I do miss his physical presence, speaking with him, receiving his hugs. The challenge since Craig's death has been to keep up with the rapid flow of life -- continuing to work on my PhD thesis, which Craig asked me to finish; moving back to the U.S. in the midst of that process to address family elder care issues; attending screenings of The Suicide Tourist to further the discussion of end-of-life issues that Craig hoped would unfold because of the film. Last month, my PhD revisions were accepted. The film has been widely viewed, and this PBS screening fulfills Craig's wish that it be viewed nationwide in the U.S.
My challenge moving forward will be continued activism on issues involving what we do with our bodies. One important question is whether the state or church have a right to demand suffering at the end of life. Ivan: I missed Dad very much, and still do, of course. Dealing with the loss was easier thanks to knowing the exact date and time in advance, and the fact that I could be sure to talk with him knowing that soon I'd lose my chances to say what I wanted to say. But still, you know, it's your dad. I dealt with a lot of sorrow at losing him. My biggest challenge was in choosing when and how to inform people of Dad's decision, death and the film. I'm proud of what he did and the bravery he showed, but of course, you can never tell what people's reactions will be. In the end I decided that his strength had to inform me, and let me open up to people. How did friends, family and others react to your participation in this film? Mary: We were very fortunate to have strong support from our children and our circle of friends, all of them focused totally on honoring Craig's wishes. I have had interesting discussions about Craig's decision with strangers. There are those who oppose Craig's decision. Several young people have asked why Craig did not simply rely on medical science to ease his passing. My response is that medicine does not have a helpful response to every situation, and that once you see someone dying in pain, you have less confidence that physicians can or will provide sufficient assistance. Another person suggested to me that people who want to end their lives can simply jump in front of a train, drown themselves, fill the garage with carbon monoxide, and so forth. The violence inherent in such methods, both for the dying person and for her or his survivors, seemed of little concern to this person. The message was, if you want to die, then you deserve to suffer. Ivan: I've experienced nothing but support from friends and strangers alike. The reaction that surprised me most was a cab driver taking me to the airport before the Sedona Film Festival. He paused for a few minutes, then told the story of his own father, who had died over the course of several painful years. He'd asked, often, for some assistance -- but of course none came, and it couldn't, here in the U.S.
Everyone I talk to -- everyone -- has a similar story of a friend, relative or acquaintance who's struggled with the painful end of a loved one. Every one of them says they wish they'd had the option that Dad had, and believed they would have taken them up on it. Have your views on the issue of assisted suicide changed at all in the past three years? Mary: My commitment to advocacy on behalf of each person's ability to exercise his conscience in making end-of-life decisions has strengthened. Craig ruminated on the issue of assisted dying long before I considered the issue. He had a copy of Derek Humphry's Final Exit on his bookshelf at a time when I found such thinking a bit alien. Having lived this experience with Craig, I better understand the issue. I want to ensure that I, and others who are like-minded, will be able to follow our consciences when our time comes, without burdensome legal restrictions that require us to submit to the authority of beliefs we do not share. Ivan: Not in the least. I do try to listen to the other side and understand their concerns, but they make no sense to me. As Dad puts it: "On the one hand, I have death; on the other, suffering and death." The fact is, everybody dies. As thinking, feeling, human beings, we should have control over when and how we do so. What was it like having a documentary crew filming Craig's last days -- and his decision to have his death filmed ? Mary: The decision was made, according to [Director John Zaritsky's] protocol, after Craig made his appointment with Dignitas. Craig took the decision on filming quickly, following an intense interview with Zaritsky. Zaritsky had emphasized to Craig that he had no expectations about what would happen; if Craig decided not to proceed, that would provide an equally interesting story. In light of Craig's and my history together, this decision was not as unusual as it might seem. Since the Vietnam era, Craig and I have been passionate about politics. Craig was very interested in having this discussion about death put to the public. His main concern was that Zaritsky's documentary would be an accurate portrayal of his experience. Once he was confident that would be the case, the filming simply unfolded along with the process of dying. When the documentary aired in Britain, there was much controversy around showing the actual moment of death. Yet Craig felt this was one of the most important points -- if that moment is left to the imagination, then any number of imaginary scenarios can be constructed. Fear thrives on the imagined. I was with Craig throughout, and I can confirm that events unfolded as depicted. Both Craig and I knew that at any time we could ask the film crew to leave, and our wishes would be respected. When Craig's ventilator switched off, I did just that so that I could have some time alone. Given our history, and our engagement with the political process, the documentary allows me to remain connected to Craig, and to our core principles. I also have a vested interest in the outcome of the political discussion as I, too, will die one day. Ivan: The crew asked to tape one of our last phone calls -- we talked over the Internet every day, and they'd wanted to show how the technology allowed us to work together. I couldn't do it, though; at the time I was too afraid of the raw emotions I was feeling and too afraid to share those powerful emotions with others. I met the crew at Dad's memorial service. You could not meet a finer group of people. They were respectful, dedicated and clearly moved by all my father had done. As for Dad's decision, I'm so proud of him. Nothing is going to change the laws and attitudes surrounding end-of-life issues unless someone steps forward and begins making that change, and as far as I'm concerned, my father was a pioneer. His decision reflected his courage, his dedication to education and his passion for social change. I am so very proud to have known him and to be his son. What do you hope viewers with differing opinions about assisted suicide and Dignitas take away from this film? Mary: My hope is that people will reflect on the veil of silence, the taboo, that still hovers around death. Physicians are too often unwilling to discuss how the end will be experienced by the patient. Doctors and hospice cannot guarantee sufficient comfort to all dying patients. In Craig's case, his death most likely would have involved a period of being "locked in," unable to move or communicate. At that point, he would want relief but could do nothing to secure it. We all need to reflect on these gray areas, gray periods of time that we wish would just go away and leave us to our daily lives, but which many of us will be called upon to face eventually. In these matters, having a living will and/or health care power of attorney only stipulates that the dying person can refuse treatment. Those documents say nothing about the manner of our death. With regard to Dignitas, my perception is that the organization, and its director Ludwig Minelli, have been demonized in the media and by political opponents. The administration of an overdose of barbiturates is not really a complex procedure. For the patient, the important part is having an experienced companion, like a Dignitas representative, who understands the process, who has experienced it, and can ensure it will proceed smoothly. Perhaps the most striking observation for me was the comparison between the information we were given by the medical profession, nonprofit ALS support organizations, and Dignitas. The first two gave vague guarantees that everything would be OK, we shouldn't worry. Dignitas described exactly how things would happen -- the anti-nausea medication, the timing of the ventilator support -- everything transpired as described. As a witness to all of these discussions, I would choose Dignitas as the most honest and forthright. Reporters have asked me leading questions about my experience with Mr. Minelli, wondering if I found him somehow strange or different. The only difference I notice is the same one that I notice in Craig and in myself -- we are willing to challenge the status quo, to remove the taboo around death. For many, that makes us [the] frightening "others." Mr. Minelli and Craig take a matter-of-fact view of death -- we all will die some day. They are able to reflect on how people, including themselves, die. In contrast, our society places an inordinate emphasis on the emotional aspect of dying, urging patients to fight death, to be brave warriors in the face of death. The decision to quietly, gracefully accept and welcome death is at odds with the emotional battle against death. Both are ways of dealing with death, one is not better than the other. However, both approaches should be respected. I fear that acceptance of death is still viewed as somehow bizarre and frightening, something to be forbidden. Ivan: Well, I hope [the film] changes minds, obviously. Seeing the pain my father was in on a daily basis shows how inhumane extending the life of someone who really wishes to die is; how cruel and unnatural it is to force someone onto life support when their wishes are clearly known and stated. If nothing else, I hope it at least makes them think -- makes them consider that perhaps they don't have the right to force others to subscribe to their own beliefs and restrictions. The title of this film is The Suicide Tourist -- what are your thoughts on that? Mary: The title has always been controversial among my family and friends. Zaritsky defended the title choice because, as we see in the film, the media has described those who travel to Dignitas as "suicide tourists." So the title is controversial. Yet it does not originate with Zaritsky or with Craig -- rather it is a description put forward in the press and by politicians interested in stemming the practice. In that sense, it is a very appropriate title. Ivan: I think it was a creative decision by the filmmakers, based on the Swiss press's term for those who visit Dignitas. It does what it needs to, which is to provoke thoughtful commentary and grab people's attention. I don't know what else might have described things better. Mary: I want to close by considering vulnerability and disability. With regard to vulnerability, the most common argument put forward about assisted suicide is the slippery slope argument that vulnerable people will feel pressured to end their lives. This argument is often made by conservative supporters of traditional family values, which leads me to ask why members of traditional families cannot trust their relatives to respect their lives and their wishes. "If somebody wants to take their own life, obviously they feel a reason for that, at that point in time. You may not think it is a good reason. I may not think it is a good reason. But you know what? It is that person's life." This observation places decisions about how their lives are lived with disabled people themselves, those who have a zest for life and choose to live it to the fullest, as well as those who choose to end their lives. The statement makes no value judgment on either decision, and honors and respects both decisions. My hope is that soon we as a society can have a grown-up discussion about death, one based on serious reflection and self-examination, rather than on politically generated fear and authoritarian dictates. For Craig, this film was a step in that direction. Ivan: I want to thank FRONTLINE for being the first U.S. [television] program brave enough to address an issue that will only become more and more prominent as the baby boomers begin to face their mortality. I want to thank John Zaritsky and Point Grey Pictures for giving my father a voice that carries beyond his life. I want to thank the viewers who are now sharing that story with us and, hopefully, admiring -- or at least understanding -- my father's bravery and dignity. Most of all, I want to say without question how proud I am to be a member of the Ewert family. My father and mother were the best parents a child could ask for, and along with my sister made up three of the best friends an adult could ask for. Their bravery and strength have been a shining example to me throughout my life, and I love them all with all of my heart.